1. GO cross: Mate flies from a single-copy P[>whs>] insertion line (the element is marked with a whs marker and gives an orange eye color) to flies from the transposase strain to mobilize the construct. Collect male progeny with Stubble bristles (genotype: w1118/Y; P[>whs>]45/Sb P[A2-3, ry+]99B). 3. G2 cross: Dark-eyed flies are crossed to the extraction strain w1118; Sb/TM6B to map and balance the new insertion chromosome. Because each G1 cross gives independent mutagenic events but the progeny from within each cross may not be independent, the G2 crosses are designated accordingly. Assign each G1 cross vial that produces interesting progeny a number, and the kept individual progeny from each vial a letter (e.g., each G2 cross will be labeled 1A, 1B, 2A, etc.) to indicate their relationships. Each G2 cross will produce w1118; 3*/TM6B males and females (where * indicates a chromosome that potentially carries a transposed P element). 4. G3 mapping cross: Map the P-element insertion by crossing w1118; 3*/TM6B males with dark eyes to w1118 females. Some new insertions will be unlinked to chromosome 3 and will give w+ progeny that also carry TM6B; discard these lines. Lines where the darker eye color is linked to chromosome 3 are examined further to identify lines with two adjacent P elements in an inverted orientation that are usable for dicentric formation. 5. G3 stock construction: Cross pigmented w1118; 3*/TM6B males and virgin females inter se to generate a balanced insertion stock. 1. G4 cross: Mate males from one of the new insertion lines (w1118; 3*/TM6B) to females carrying a FLP source (w1118; P[70FLP, ry+]4A) in vials. Label the vials with a waterproof marker. Allow these cultures to continue for 5 d (until crawling third instar larvae are present). At this time, there should be numerous larvae crawling in the food. 3. Immerse the vials in a 38°C water bath (such that they are covered up to the height of the plug in the vial) for 60 min. This induces the 70FLP gene and catalyzes recombination at FRTs. 5. Adult progeny will begin emerging about 10 d after the cross was first set up. Examine the eyes, bristles, wings and abdomens of progeny up until d 18 of the cross. Lines with two adjacent P[>whs>] insertions in an inverted relative orientation show a characteristic phenotypic syndrome when FLP is produced during development. This syndrome includes roughened eye facets, irregular notches in the wing margins, missing and shortened bristles, and etched tergites on the dorsal side of the abdomen. Lines that do not produce these phenotypes are discarded (see Note 3). 1. Repeat the G4 cross from Subheading 3.2.2. to generate larvae carrying inverted FRT-bearing P elements and the 70FLP gene. Allow the culture to continue until crawling larvae appear (typically 5-6 d after setting up the cross). 3. Immerse the vials in a 38°C water bath for 60 min. 5. Fill two wells of a dissection dish with PBS, a third well with 0.5% sodium citrate, and a fourth with 45% acetic acid. 6. Select w1118; 3*/P[70FLP, ry+]4A larvae from the heat-shocked vials for dissection. Sibling progeny that carry TM6B can be excluded by scoring for the Tubby marker. 7. Rinse the larvae in one well of the dissection dish filled with PBS. 8. Grasp a larva about halfway along its length with one pair of forceps, and with another pair of forceps, grab the anterior tip of the larva. Pull firmly but gently on the anterior end, so that the mouth-hooks and anterior structures come out. These usually include the salivary glands, some fat bodies, imaginal discs, and brain. Tease apart the brain from the other structures. 9. Transfer a brain to sodium citrate and incubate for 10 min. 10. Transfer the brain to 45% acetic acid for 1-2 min. 11. Transfer the brain to a drop of 45% acetic acid on the middle of a glass slide. Cover with a siliconized cover slip. 12. Fold a piece of Whatman filter paper in half and place it around the prepared slide. Place the sandwich on a benchtop, place your thumb on the filter paper directly over the cover slip, and press down very hard for 30 s.
13. Remove the filter paper and place the glass slide on a block of dry ice. Incubate for 5 min. 14. Remove the slide from the dry ice and, using a razor blade, quickly pop off the cover slip from the frozen slide. 15. Immediately immerse the slide in a Coplin jar filled with PBS. Slides can be collected at this point over a period of a few hours. 16. Transfer the slides to a Coplin jar filled with a DAPI solution. Incubate for 5 min. 17. Transfer the slides to a Coplin jar with PBS to rinse for 5 min. 18. Remove the slides and tamp off any remaining liquid. Cover the stained sample with a small drop of glycerol and place a regular cover slip on top. Gently flatten the preparation under a sheet of Whatman filter paper and seal with nail polish. 1. Repeat the G4 cross from Subheading 3.2.2. to generate larvae carrying adjacent FRTs and the 70FLP gene. Allow the culture to continue 2-3 d after setting up the cross. 2. Transfer the parents to a new vial and discard the old vial. 3. On the appropriate day for the tissue of interest, immerse the vials in a 38°C water bath for 60 min (see Note 5). 5. For analysis of imaginal discs, wait until crawling larvae appear in the vial. Select w1118; 3*/P[70FLP, ry+]4A larvae and dissect as described in Subheading 3.3. (see Note 6). 6. For analysis of adult structures, examine adults as they eclose. The approximate stage of development when dicentric chromosomes were formed can be deduced based on when those flies eclosed after heat-shock induction. For example, adults that eclose 10 d after the heat shock were typically embryos or young larvae at the time of heat shock. 7. Photograph adult body parts with a dissecting or compound microscope equipped with a camera. 1. The P[>whs>], P[RS5], and P[RS3] constructs (which carry a whs marker gene and two FRTs) have been successfully used in this technique. A hypomorphic marker gene, such as whs, is required for this protocol. The location of many existing FRT-bearing P-element insertions can be found in Flybase (www.flybase.bio.indiana.edu). 2. Some new single-copy insertions will also be included in this category, although many, in fact, do carry two insertions near the starting insertion site (8). Occasionally, Sb+ G2 progeny may have mosaic expression of the whs marker. These are often recombinants that carry P[>whs>] and the P[A2-3] transposase source or, less likely, insertions that are subject to position effect variegation. Discard these. 3. Heat-shock induction of the 70FLP gene in this protocol is timed to maximize the incidence of dicentric chromosomes as cells in these tissues proliferate. The severity of these defects will depend on the frequency at which dicentric chromosomes are formed and the amount of aneuploidy that results after cell division with the dicentric and acentric products. However, lines in which dicentrics form at moderate to high frequencies should easily be spotted. Even dicentric chromosomes that produce no aneuploidy can give high incidences of roughened eyes and notched wings. The overcrowding of progeny in vials should be avoided. 4. The behavior of the released acentric fragment can be quantitatively examined in the anaphase spreads of these preparations. Comparison to a normal control strain is necessary to separate squashing artifacts from consequences of dicentric formation. 5. Cell division in many imaginal discs continues until the prepuparium stage, but proliferation of some tissues is more restricted (13). Induction of FLP should be timed to maximize the production of dicentric chromosomes when the tissue of interest is actively proliferating. For example, the cell division schedules in the eye-antennal imaginal disc during larval development are well characterized. 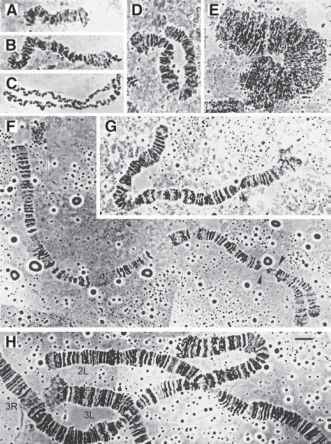 This allowed cell cycle analysis of the consequences of cell division with a dicentric chromosome (4). Dicentric formation in male germ line stem cells can be obtained by heat shocking a 1- to 2-d-old culture. Dicentric formation in the female germline can be induced by heat-shocking females at virtually any point of development prior to or even after eclosion. 6. Any tissue can be examined from these larvae. Cell division and cell death rates can be estimated by examining imaginal discs, which are mitotically active in this period. Even the examination of the postmitotic but polytenizing salivary glands can be useful: The site of unequal sister-chromatid exchange can be mapped quite precisely by preparing polytene spreads from crawling larvae in which 70FLP was induced 2-3 d after egg laying (2).